Hiatal hernia (HH) commonly associated with gastroesophageal reflux disease (GERD) and its incidence is approximately 5 per 1000. About 95% of these are type I hernias of sliding variety that are not commonly associated with serious complications 7 . The remaining 5% can be classified as giant paraesophageal hernias (PEHs) type 3 and 4 and are associated with significant complications 7 . Our understanding of hiatal hernia has evolved over the years. Initially considered an anatomical pathology, our focus has now shifted toward the physiology of the esophagus. The appreciation of the physiological link between HH, GERD, and the related problems has caused a paradigm shift toward management of hiatal hernia. Now, we attempt to restore the physiologic function of the esophagus and lower esophageal sphincter and not just a simple repair aimed at restoring the anatomy of the lower esophageal sphincter (LES). Multiple techniques and there modifications are described in literature for repair of hiatal hernia. 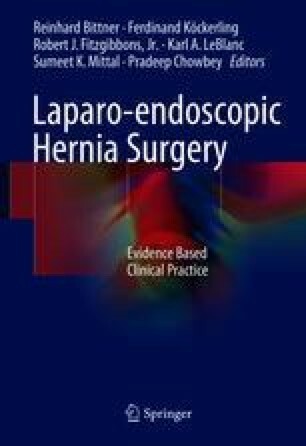 In the last two decades, hiatal hernia repair has undergone challenges in terms of newer approaches like tension-free repair, use of prosthetic mesh or new biomaterial, laparoscopic approach and lately NOTES, single-port laparoscopic surgery, or robotic surgery.